I have discussed my own LEGO travel mementos and even mentioned those quirky miniature Japanese bricks, Nanoblocks and Palmo Blocks. However, recently my son received our first (and probably last) set of true LEGO clones as a souvenir. 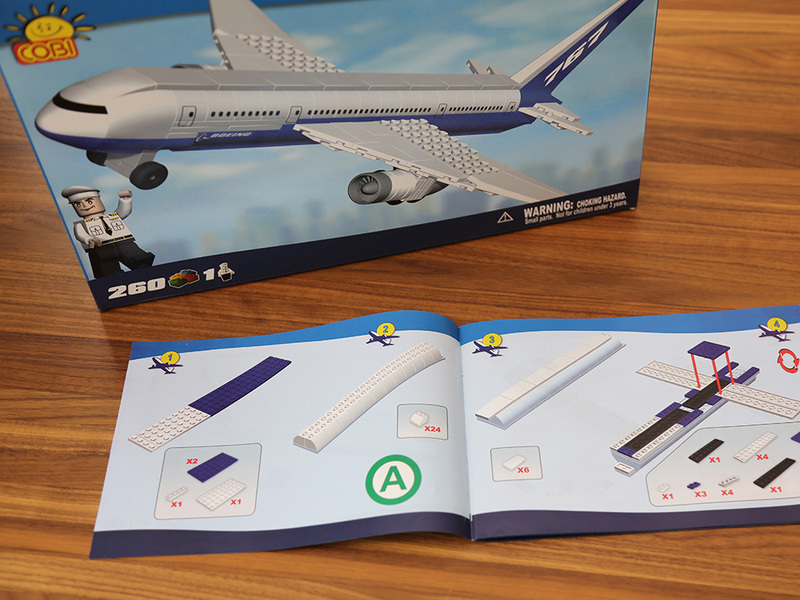 The set is COBI Boeing 767, a 260 piece kit from the Eastern European manufacturer. 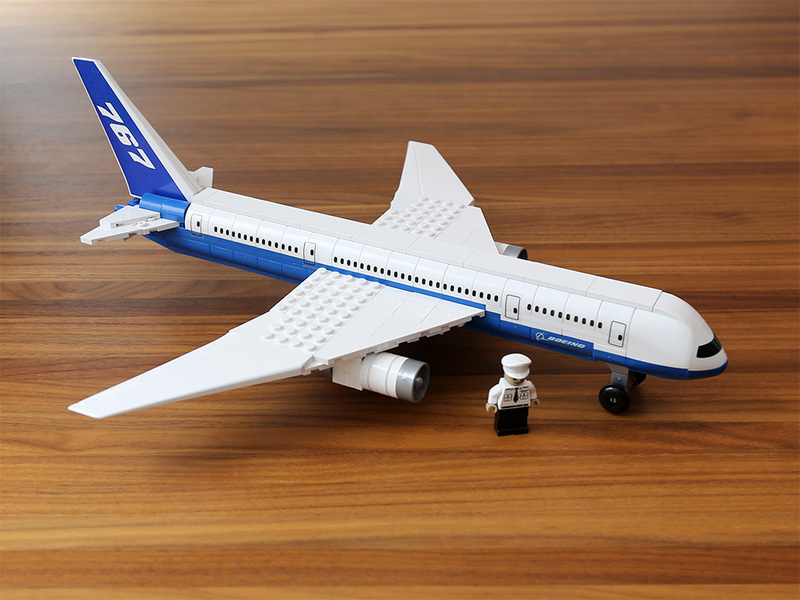 The plane is microscale, even though it includes one COBI minifigure that won’t fit inside. When LEGO first started manufacturing their now-famous plastic bricks some sixty years ago, they patented the heck out of them. In fact, they even designed, shipped and patented many variants of the locking mechanism to keep copycats at bay. And by all appearances, their efforts were quite successful for many decades, especially in the Western world where clones remained hard to come by. But the nature of the utility patent includes an expiration date, which for the basic LEGO structure has now long since passed. TLG tried to protect the design under the European Union trademark law, but failed since the shape was deemed a functional design. In all fairness, this is how the patent system is supposed to work. An inventor gets certain time-limited protections, in return for the invention later falling into the public domain for the benefit of the society. Nevertheless, clone products are not widely appreciated by AFOLs, many of whom have an understandable affection towards the real deal. This was my first close brush with the clones. To cut a long story short, I didn’t walk away particularly impressed and neither did my son. The basic COBI brick is a near perfect clone of a similar LEGO brick, only the text COBI replaces the tiny LEGO logo printed on the studs. They are fully compatible with LEGO bricks and you probably couldn’t tell them apart without looking very closely. Roughly speaking, these identical clone bricks made up perhaps a quarter of the set. The minifigure is also a near perfect clone, although the first thing my son noticed was the protruding nose on the head. The color palette, though, is slightly different as are the prints. The pilot minifigure looks almost sinister (perhaps in line with his evil clone character) with his crooked face and weird skin color more suitable for Mordor orcs than a human of any race. The rest of the bricks are somewhat LEGO compatible too, but unlike any LEGO I have seen. Expectedly this includes special pieces like the wings and engines (newer pieces where LEGO probably still holds legal protections), which are different from their LEGO counterparts. The angled bricks are different too, missing the rear wall, which makes them quite a bit less sturdy. Perhaps the most surprising set of COBI bricks were the dual-studded (as well as studdless, dual-holed) ones, for which I don’t think LEGO has an equivalent. In fact, the whole structure of the plane is held together by bricks that have studs on both sides of them, which allows building the plane from the center towards both up and down. I could see an AFOL with SNOT tendencies finding these bricks useful. While there were some interesting details and certain well-cloned parts, the overall building experience left a lot to be desired. I didn’t say anything about my feelings to my young son, to gauge his natural reaction (he is too young to feel strongly about clone products or patent wranglings), and surprisingly he mirrored my thoughts quite vocally. Building COBI was not as fun as building LEGO. He actually concluded by saying something like: let’s not do this again. The hard-to-read instructions, non-welcoming color palette and graphics are the first problem. The kit lacks that certain warmth so inherent to any LEGO set. 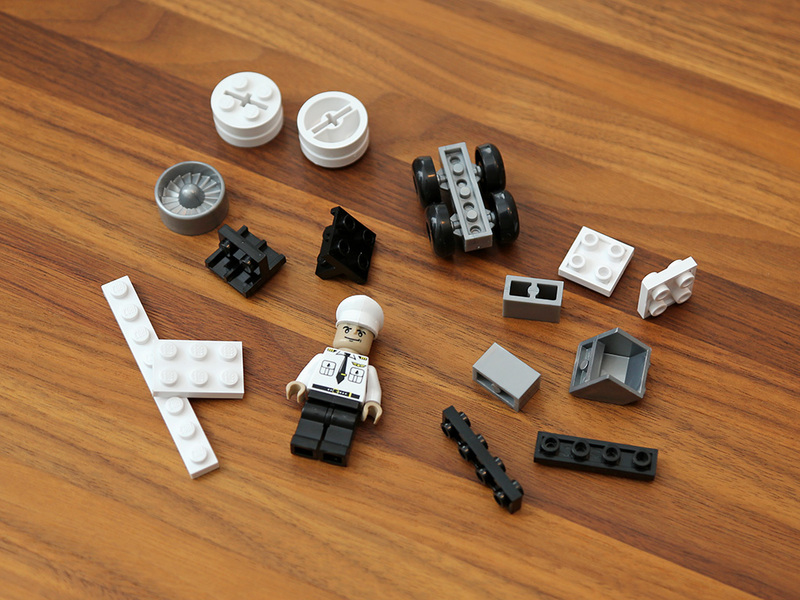 Also, the plastic used in some bricks and details like wheels looks and feels very cheap. But most importantly, it just doesn’t build quite as well. You can see the decades of thought and improvement that has gone into making LEGO bricks and sets as good as they are. Even the basic clone bricks, which look and feel pretty much identical to LEGO, just don’t click in place quite as satisfyingly. Perhaps there is the odd difference in some angle or material. I really tried to keep an open mind and reject any personal bias, yet that’s how it felt and my son’s natural reaction agreed. Even more so, the COBI design decisions and non-cloned parts were clearly inferior much of the time. Compared to my son’s robust LEGO airplanes, the COBI jet keeps dropping its nose or wheels when you look at it wrong. Last, but definitely not least, where TLG has gracefully moved away from this mistake of yesteryear – the COBI set is full of STAMP. Shudder. In Korea lego is king but clones are readily available. Most of them are made in china and are pretty awful. Probably the pick of them make a less quality version of Lego’s classic pirates (slightly different sets). I really liked Pirates and they are so cheap ….. but the clones quality still makes it unsatisfying. There is a Korean made brand called Oxford and their quality rivals Lego. There are a few things that are more childish (I don’t think Korea has AFOL’s) and they certainly could improve their marketing A LOT. The sets are excellent though and it is half the price as well as being locally made….. and yet Lego still dominates the amount of retail space it gets and in sales. Interesting insight into the clones, Andrew. Thank you for posting! I will surely keep my eyes open for the products you mention, if I ever come across them, to see what they’re like.